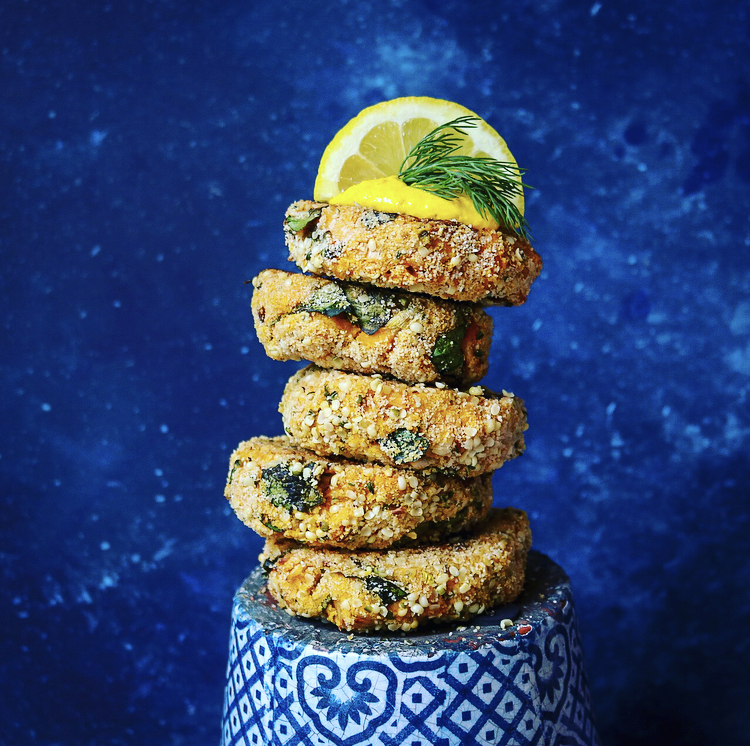 Funnily enough, each one of these deliciously tasty fish cakes contains all of the elements that you could possibly need for the perfect meal, so technically you don’t even need to eat anything along side it! They contain nutrient-dense, high fibre complex carbohydrates, a lot of good quality protein, anti-inflammatory Omega 3 essential fats and a ton of different brightly coloured veggies providing a whole host of antioxidants. They get wonderfully crispy too, even though they are baked and not fried. This means they pass the very tricky fussy eaters test too - my kids go through phases of only eating ‘crunchy’ food, so I have to get creative with their dinners or else it’ll be chicken nuggets every damn night! So these really are the perfect meal for the whole family to enjoy. They also freeze wonderfully, so are a great, healthy batch cooking option. For those of you that regularly follow my recipes, you will know that I am certainly not calorie or weight driven. My aim is to maximise the nutritional content of my food by ADDING ingredients rather than restricting food groups or calories. I am all about positive nutrition and positive body image. But having said that, there are times, particularly before a holiday when I finally emerge from the onesie-loving-sofa-snuggling-mince-pie-eating-winter, that I look to shift a few stubborn pounds. With that in mind, I created these! There’s no need to go on a silly crash diet when this is a perfect meal for those wanting to watch their weight without compromising on nutrition in the slightest. One serving (3 fishcakes) provides only 270 calories, 23g of protein, 4g of fibre and an enormous 341% and 60% of my daily Vitamin A and C requirements respectively. I serve them with a side salad or some roasted tomatoes and my husband has an extra one (or sometimes two!) fishcakes to fill him up a bit more. BONUS RECIPE! I have made this Zesty Lemon Tahini Turmeric Sauce to go on pretty much EVERYTHING for the past few years. Once you make it, you’ll find a reason to put it on anything that’s edible and it’s a fabulous way to get in the anti-inflammatory, antioxidant wonder spice that is Turmeric. · Dice the leeks and chop the spinach. · Heat the oil over a medium heat and sauté the leeks for approximately 5 minutes. · Add the spinach and sauté until it has wilted. · Wash and chop the butternut squash and sweet potato into small cubes (no need to peel the sweet potato skin, it’s got a ton of fibre in it). · Steam the root vegetables until soft (approximately 10 minutes). · If you have a double-layered steamer, steam the fish at the same time for 5 minutes, until it flakes easily. If you don’t, then wait until the sweet potatoes have finished and use that steamer instead. NB — if you don’t have a steamer at all, you can boil the sweet potatoes and fish. · In a large mixing bowl, mash the sweet potatoes and squash. · Add the sautéed leeks, spinach, chopped spring onions, herbs, lemon juice and zest and combine well. · Add the flaked fish and mix thoroughly. · Season with a little salt and fresh pepper and chilli flakes if you like a little spicy kick. · Combine the breadcrumbs and hemp seeds in a shallow dish. · With wet hands, mould 2 tbsp worth of the mixture into slightly flattened balls and coat in the flour/seed crust. · Repeat until all of the mixture has been used and chill in the fridge for half an hour (or freeze in individual portions if you are batch cooking). · When you are ready to eat, put the fishcakes on a greaseproof paper lined roasting tray and cook in the oven for 30 minutes or until they have become crispy on the outside. · Serve with a squeeze of lemon and a drizzle of the Turmeric Tahini Sauce. · Peel the turmeric and drop onto a running blade in a high-speed blender. · Stop the blender and scrape down the sides with a spatula so that the turmeric is at the bottom. · Add all of the remaining ingredients and blitz. · Store in an airtight glass jar in the fridge — it will keep for 3 weeks.